Get your appetite and summer-loving attitude ready thanks to a tasty treat from Play n’ Go called Sizzling Spins. With its delicious play on colors and grill favorites, this game offers foil blockers that act as wilds and offer Sizzling Spins free spins, another Free Spin mode, and a Hot Reels feature that offers a multiplier. In this Sizzling Spins slot review, you will discover the best features that make this 5-reel and 243 ways to win the game a delight for all types of slot players. A screenshot is worth a thousand words, right? Here you go! But in the end, you have to try Sizzling Spins yourself – one of the recommended casino sites should fit perfectly! An exciting and delicious treat awaits players who will play Sizzling Spins for real money. With its 243 paylines arrangement, the big win can be earned anywhere, provided at least 3 similar symbols are shown on the reels. Speaking of symbols, watch out for mushrooms, onions and tomatoes, and these are joined by sausages, chicken wings and rubs. Coin range starts from 0.20 to 100.00 which can work for many players. The hottest offers on the grill are Foil Blockers which turn to wilds and the free spins feature with the chilies. This feature gets the best win, up to 5,000x the bet made thanks to an x5 multiplier. There are two hot features to watch out for in this game- the Hot Reel and Sizzling Spins free spins feature. The Hot Reel is activated on reels 1, 3 and 5, and Foil Blockers that land on these reels become wilds and trigger the re-spin. In the free spins mode, players can pick a chili to reveal a multiplier, up to x5. This Play n’ Go presentation is optimized for use in Android and iPhone devices, with no download of an app required. This game is also available in free play, today. 3. What is the RTP factor of Sizzling Spins? Designed as a high-variance game, Sizzling Spins come with a 96.49% RTP. 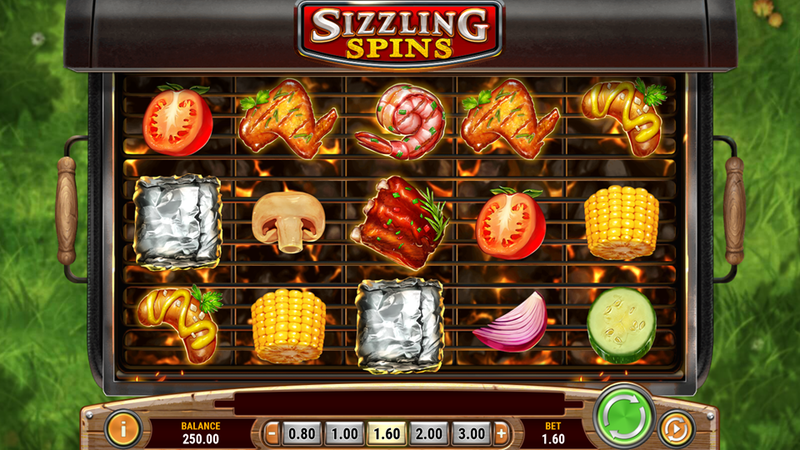 Sizzling Spins is a high-volatility game with lots of tasty features to keep you playing for more. The big win is easy to get, thanks to its use of Hot Reel and Free Spins features which promise re-spins and multipliers, up to x5 the total bet made!